In the silence of the forest, I can hear my own heart beating. Beating fast. Somewhere in the distance, two shining eyes are moving swiftly, looking for prey. Deeper in the wilderness, a village that has been abandoned by all but five people, is keeping vigil for wild boars and porcupines who threaten their crops. With the night jar’s call for company and leopards and other wild animals lurking outside, I tuck in to sleep in one of Binsar Wildlife Sanctuary’s only four private estates, dating back to 1856 – refurbished by its young heirs with solar energy for power, an organic farm for most of its produce, and legendary stories that have been handed down through the generations. Long ago, when I adopted a nomadic life, I imagined that traveling responsibly – conscious of my impact on the local people and the environment – meant slumming it out. That if I made this choice, I’d be staying in rustic places and sacrificing urban comforts. Hiking along Quilotoa Lake near Black Sheep Inn, Ecuador. My private waterfall at Bali Eco Stay! 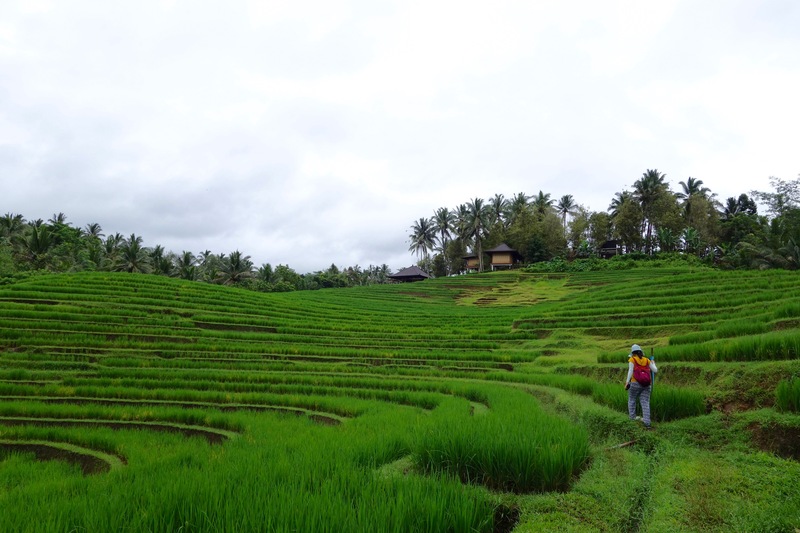 I dropped my not very original ‘Eat Pray Love’ plan of staying in Ubud for a month – because what was presumably a sleepy little village of rice farmers is now overflowing with tourists, traffic and villas, with only some sad patches of rice paddies. It wasn’t until we landed at Bali Eco Stay in Tabanan, that I found the Bali of my dreams – vast, endless rice fields; village folk who believe in karma and don’t lock their doors; mountain spring water that tastes better than bottled water. On the southern slopes of Mount Batukaru, we spent some dreamy days hiking in solitude along rice terraces and cacao plantations, feasting on delicious, organic farm-to-table Balinese food, and spotting fireflies late into the night. Oh, and we had a private waterfall all to ourselves, that also powers 60% of the lodge through clean hydro-electric power! The bungalows at Bali Eco Stay are built by local craftsmen using recycled timbre. The lodge has its own permaculture garden and organic rice paddies, runs a garbage collection program in 3 local villages, and trains and employs staff from the surrounding villages. Read more about their environmental efforts here. The estate at twilight. Photo via Grand Oak Manor. Binsar Wildlife Sanctuary was kind of born at Grand Oak Manor. The story goes like this: Henry Ramsay, the British Commissioner to Kumaon in the mid 1800s, bought this estate for his own house, and a few other pieces of land for his friends. Then he declared the forest a protected area, where no one has been allowed to buy land or build since. Staying with my friends Shikha and Sindhu – the young heirs of Grand Oak Manor – in their eco-friendly estate, with stellar glimpses of the snow-capped Himalayas from the terrace and traditional Kumaoni dishes that are rare to find even in Kumaon, hiking with a local guide to the friendly forest villages of Binsar, and being surrounded by nothing but dense forest, was incredibly therapeutic. Grand Oak Manor is largely powered by solar energy, grows most of its own produce, and trains and hires staff from the villages of Kumaon. They also offer multi-day village walks near Binsar, with overnight stays at traditional Kumaoni homestays run by village families. ‘End of civilization’ kind of feeling at Black Sheep Inn. Winding along the Ecuadorean Andes in the back of a milk truck, we felt like we had reached the end of civilization when we dropped off in Chugchilan – a remote outpost at over 10,000 feet, where you truly feel it’s just you and the mountains! We hiked along precarious, panoramic ridges and along the crater of the stunning Quilotoa Lake, hung out with local shepherds in the mountain meadows and shared moments with the native llamas at Black Sheep Inn, and felt blissfully disconnected from the modern world. Black Sheep Inn literally brought tourism – and employment opportunities through it – to Chugchilan. The lodge is powered by solar and wind energy, has a zero waste policy (and has introduced waste recycling in Chugchilan), and its dry-decomposting toilets are actually fun to use! Read more about their eco initiatives here. “Home” under the stars at Forsyth Lodge. I’ve experienced my fair share of wildlife lodges around Central India, but my recent stay at Forsyth Lodge in the buffer zone of Satpura Tiger Reserve surpassed them all. Built by a naturalist who also played an instrumental role in bringing a conservation-focussed model of tourism to Satpura National Park, the lodge’s earthy luxury and locally inspired architecture drew me right in. Our days were spent walking, cycling, canoeing and on day/night drives in tiger, leopard and sloth bear territory, but a bigger highlight were the nights – drinking ‘mahua-tinis’ (a local brew made from mahua flowers) under incredibly starry night skies, in the company of the lodge’s passionate naturalists and their stories of the wild. Forsyth Lodge has used only 10% of their land for building, and has worked over the years to transform the barren acres with indigenous trees and shrubs. Much of their produce is sourced from local farmers and most support staff are trained and employed from the surrounding villages. Read more about their initiatives here. Also read: Wildlife Tourism: Are We Saving the Tiger? View of the Simien Mountains during breakfast. Photo via Limalimo Lodge. One of my fondest memories of Ethiopia is hiking in the dramatic Simien Mountains, spotting gelada monkeys and white-headed ravens, sharing homemade beer and injera with locals in their round eucalyptus houses on the rural countryside – thanks to Limalimo Lodge, which is bringing sustainable tourism to the remote Limalimo village. I long to go back and sip tea at the edge of the escarpment on which the lodge is perched, and seek solitude amid the rugged cliffs in this fascinating country. Limalimo Lodge has been built using rammed earth and other local, eco-sensitive building techniques. Waste water is reused, solar energy powers part of the lodge, and the local community is closely involved. Read more about their responsible initiatives here. The Ladakhi village next door. It breaks my heart to see how Leh has succumbed to trash and traffic, thanks to irresponsible mass tourism. But on the outskirts of the city, in the backdrop of the Stok Kangri peak, is an environmentally-conscious oasis called Tsermang, set up by Frenchman Laurige. It was my first stop in Ladakh, and I remember acclimatising to the altitude with tea on the shores of the pristine Indus River, hanging out in the picturesque Ladakhi village next door, and appreciating how water needs to be conserved in this cold mountain desert. Tsermang Eco Camp is a summer-only camp, with no permanent building materials. From the bedsheets to the food, almost everything is locally and organically sourced, and the luxurious bathroom has been designed with water conservation in mind. Lost in time at Gal Oya Lodge. The moment I read about wild elephants who swim from island to island in a river in Gal Oya National Park, I knew I had to get myself there. And that isn’t even the only fascinating reason to visit this remote part of eastern Sri Lanka. Meeting the last generation of the indigenous Vedda people, who grew up in caves deep in the forest and can smell the presence of an elephant in the wind, was an experience I can never forget. All thanks to Gal Oya Lodge for putting this forgotten national park on the map of Sri Lanka! Gal Oya Lodge hired some of the park’s most notorious poachers as their staff; not only do they know the forests (and the movement of other poachers) better than anyone else, they also act as the park’s guardians since their living now depends on it. A brilliant attempt to protect wild Asian elephants. My private plunge pool at Lakshman Sagar! My first tryst with eco-luxury in India was at Lakshman Sagar, and I became a convert. Away from the touristy bits of Rajasthan, this restored 19th century hunting lodge uses the zero kilometer concept to source everything from building materials to interior design, from the surrounding villages of Pali – and yet is indulgently luxurious. I remember being awed by the big rock pool, precariously carved out of a single rock, indulging in traditional Rajasthani food, hiking in the rocky terrain of the Aravalis, and watching wild peacocks dance from the roof of what was once the zenana (women’s quarter). Lakshman Sagar keeps the 19th century heritage of Rajasthan intact, while its lavish cottages have been sustainably built using locally sourced wood, stone and mud, and the zero kilometer philosophy. Learn more about the architecture here. Far from civilization at Feynan. Photo via Feynan Ecolodge. It is one thing to meet the suave new generation Bedouins in the Wadi Rum, quite another to be hosted by traditional nomads deep in the stark, barren Dana Biosphere Reserve. Sleeping on the roof of Feynan Ecolodge under the Milky Way and learning how the incredibly starry skies remain a compass for these nomads, sipping tea in the temporary tent home of a Bedouin family, and cooling off under serendipitous waterfalls in remote canyons are some of my fondest memories of Jordan. Feynan Ecolodge is run entirely by the local Bedouin community, bringing employment opportunities to the remote Wadi Finan and helping conserve local traditions and the Bedouin way of life. Are any of these eco-lodges on your bucket list? Which others have you discovered on your travels? I was hosted at some of the eco-lodges above and paid for the others myself. I only recommend places I’ve truly loved! Join me on Facebook, Twitter and Instagram for more sustainable travel ideas. If I happen to visit any of the above places I would definitely opt to stay in these Eco Lodges you have mentioned! Your blogs are really inspiring! Scintillating!!! loved the Bali eco stay & stars in Jordan…the most….my eyes had a beautiful feast!! I’m glad! Hope you get to experience them in person soon. WOW.I love you more now. What else can be better than reading this, for an environmental blogger like me. yay! I’d love to visit any of these, you are so lucky! Awesome pics and all places were looking so beautiful and peaceful..
Beautiful post. Thanks for sharing Awesome pics. All your posts keep on increasing my bucket list :D. Beautiful Share. Incredibly beautiful. Ethiopia and Sri Lanka are both at the top of my list so I will definitely be checking out these lodges. Shivya: I have enjoyed your travels and photographs. Enough cash and 25 years less and I would be preparing my trips. My favorite ones are 1)Bali Echo Stay, 2)Lakshiman Sagar3) Simiens Mount. Wonderful places!!! Previous PostMy Most Memorable Sunrises, Sunsets and Night Skies of 2016. Next PostHow to Score a Schengen Visa on an Indian Passport.